Case two is a 52-year-old lady, who works in a care home. She underwent bilateral ceramic on ceramic corail pinnacle total hip replacements for osteoarthritis. The left was done first in 2012, followed by the right in 2013. The patient was seen annually and felt her hip replacements were functioning well with an oxford hip score of 47/48 bilaterally. Five years following right THR she represented acutely with pain in the right hip. There was no history of trauma. Blood CRP was 4.5mg/l (normal < 5), ESR was 20 mm/hr (normal <20), WBC 6.9, which is reassuring for infection. The cup and the stem are made from titanium so blood metal ions for cobalt, chromium and titanium were taken preoperatively. Post-operative radiograph demonstrating the new right ceramic on ceramic total hip replacement. Compared to the left hand side, the right liner is not correctly seated. See the image below. This follow-up radiograph demonstrates that the ceramic liner was not properly seated within the acetabular shell. The AP radiograph clearly demonstrates the ceramic liner fracture. The lateral radiograph demonstrates the large amount of ceramic debris. A preoperative CT scan is needed to visualise ceramic fragments which may not be visualised on a plane radiograph. Additionally, axial CT scans can assess cup placement as ceramic liner fracture is greater if the cup position is outside the optimal antiversion range. If the cup position is acceptable and the cup is undamaged and well fixed then a liner exchange and thorough washout may be acceptable for the revision. If the cup is damaged or in an unacceptable position then the whole cup needs revision. The preoperative CT showed that the cup was in an acceptable and optimal antiverted orientation. 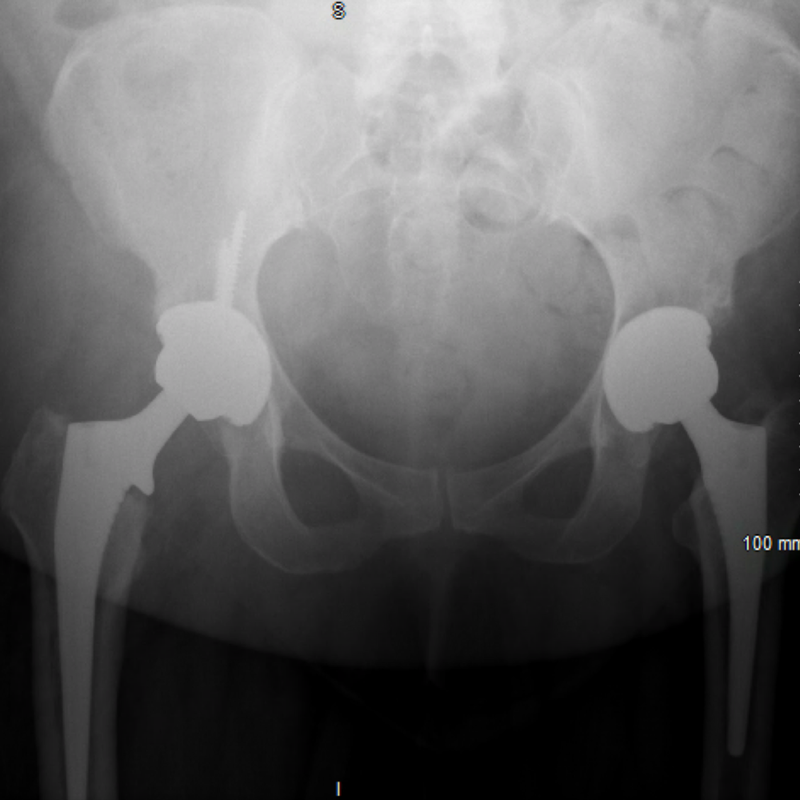 EOS was not obtained preoperatively as the patient presented with acute ceramic liner fracture, but would have helped to assess leg length preoperatively and assisted in planning the cup and stem revision to reconstruct hip anatomy. Fracture of ceramic liner due to misalignment of ceramic liner (not inserted in line with the taper). Single stage revision THR. 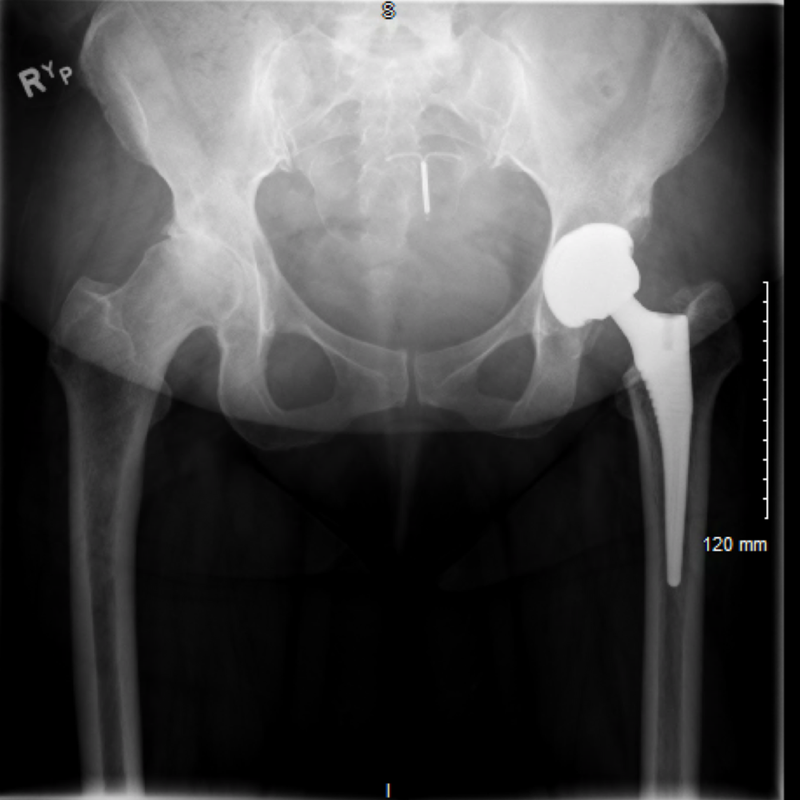 The preoperative plan was to retain the well-fixed Corail stem and to do a single acetabular component revision with a standard off the shelf acetabular cup and a ceramic on ceramic bearing. No acetabular bone loss or bony defects, good medial wall bone stock so an off the shelf hemispherical cup can be used. This is a case of ceramic fracture so revision requires a ceramic on ceramic or ceramic on polyethylene bearing. There is no outcome data for dual mobility bearings used in this situation and metal on polyethylene bearings are contraindicated. Where stem retention is possible, revision heads would be required to reuse the taper, otherwise the stem will also require revision. 5 capsule samples sent for extended microbiological culture. Ceramic liner fragments removed and thorough wash with 3 litres of saline. 48mm pinnacle cup explanted with care to retain host bone stock. A 52mm hemispherical cup was re-implanted with screw augmentation. This acheived an excellent hold with the screws and a new biolox 40mm ceramic liner was inserted. Revision heads were ordered and the stem was inspected with the intention to retain it. However, there was a notch on the inferior part of the neck where the neck must have been impinging on the cup. Stem was removed using Midas rex fluted pencil reamers, thin flexible osteotomes and then the symmetry stem removal system. Revision broaches were used and the Corail stem upsized from a 9KHO to a 10KHO. Offset test - Lateral shuck test - correct offset achieved with a +5 head due to the medialisation of the cup. Leg length tests - Longitudinal shuck has good tension. Galeazzi test demonstrates equal leg length. Anterior stability - Unable to dislocate anteriorly with push test or internal rotation. Posterior stability - At 90 degree hip flexion, difficult to dislocated with 45+ degrees internal rotation. Soft Tissue tension - Posterior capsule and short external rotator repair under appropriate tension. Wash out with 3 minute Chlorhexadine wash to prevent infection then a further 3 litre wash to remove as much ceramic particulate material as possible. This demonstrates the software used to plan the hip replacement pre-operatively. This ceramic femoral head shows evidence of stripe wear (red arrow) suggesting that the femoral head was articulating with the edge of the ceramic liner. The neck of the stem was notched suggesting that the stem had been impinging against the acetabular component. This is why the stem was replaced. The horizontal scratch marks on the neck are from the explantation process. This shows the explanted ceramic liner which had fractured, causing the acute presentation. Post operative AP pelvis radiograph shows a well positioned cup with 2 screws and a primary corail size 10 KHO stem with appropriate canal filling and restoration of offset, centre of rotation and leg length. This lateral radiograph is showing the revision THR with a collared size 10 KHO Corail and a 52 mm multi-hole pinnacle gription cup with 2 x screws. The patient was nursed in HDU for 12 hours which is routine for all revision patients. After transfer to the ward the patient was allowed to fully weigh bear on day 1 post operatively. They were discharged 7 days post operatively and recovery was uneventful. Walking was improved and pain free. Ceramic fracture is rare with a reported incidence of between 0.013 and 1.1 of all ceramic on ceramic bearings. Incidence has decreased with the 3rd generation ceramics (biolox). Mechanism of ceramic liner fracture is either cyclic impingement between the neck of the stem and the acetabular component due to cup malposition in the axial plane or misalignment of the liner within the acetabular cup (liner not seated correctly in the acetabular cups taper). Understanding the mechanisms of failure ensures that cup and stem are carefully inspected intraoperatively for any 3rd body wear. As in this case the notch on the neck must have been caused by impingement on the cup which caused head subluxation and edge loading on the opposite side of the liner leading to the liner fracture. If this wasn't revised there would be a risk of femoral neck implant failure. If there is any damage to the femoral neck the stem must also be revised. The revision bearing must be either ceramic on ceramic or ceramic on polyethylene. Metal on polyethylene must not be used as this causes high elution of metal ions and have been linked with metal ion toxicity which can cause blindness and renal failure.